You can choose tunes alphabetical, by composer or style, and you can put together playlists. Existing tunes can be corrected or changed, and you can add new, own tunes to your library. Fellow musicians without iRealBook, but an iPhone, can get particular tunes by email. I rate this iApp five stars! • Song Editor that allows the user to modify existing songs and to create new ones. • Ability to share user modified or created songs via email. • 600 songs included (see Song List page). • Each Song can easily be transposed to any key. 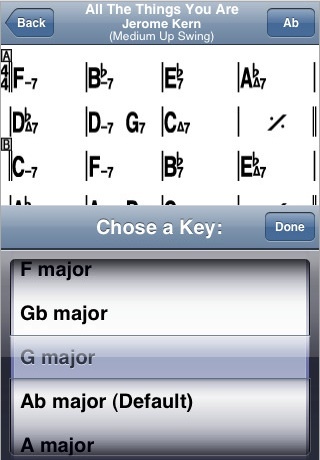 • Each chord sheet fits on one screen, no need to scroll. • Big fonts, easily legible from a distance. • Night theme option (white notation over black). • Swipe to next/previous song. • Ability to create playlists. • Eb and Bb transpositions for horn players. • Option to disable screen auto-lock. • Growing database of songs (requests and submissions are welcomed). This entry was posted in New Release and tagged iPhone, Jam Session, Macintosh, RealBook. Bookmark the permalink. how do i download this software?? You have to buy it at the iTunes store, like any other iPhone/iPod application.